Refrigeration systems inherently accumulate oils in the refrigerant charge and tend to then reside in evaporators where degradation to performance and efficiency begins-and may become quite severe. Efficiency losses of 8% may be expected with oil concentrations within refrigeration evaporators (charge) as minimal as 3-4%. Recognizing that most operating systems without some means of intentful separation may far exceed these levels presents a real issue to an energy minded operation. 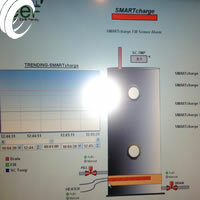 SMARTcharge features recognize this effort by affording a continually monitored and functioned (idle and operating) SMARTcharge distillization package. This includes the remote SMARTtank fitted with upper and lower Optical Switched Lenses, Heater and Sensing Thermistor as well as necessary Fill /Drain Valves, Fill Pump and a non electric, Checked Differential Flow Valve (C-DFV). The C-DFV maintains 5psi above evaporator pressure as a "motive means" to which process oil may be returned to the Oil Sump. 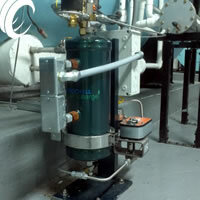 Through the logic, the tank, when empty, shall be filled via the SC LIQUID FEED PUMP from base of evaporator where it then becomes isolated from the chiller system.The direct Immersion sensor recognizes the mixed refrigerant -oil solution temperature, sending an output to the tank heater. 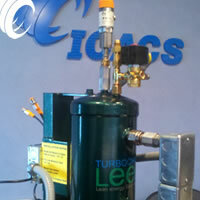 This heater functions to maintain a preset tank temperature value. The heat sunk tank creates a boiling effect to the refrigerant, permitting a vapor return flow via the vent line to "evaporator side" of chiller. As the level drops, the optics may function a further fill-this shall be continue until the PROCESS CYCLE is found complete. A PROCESS CYCLE occurs when a FULL condition and the preset solution temperature is present, returning the oil to the compressor sump for intended bearing lubrication. The logic economically functions the SMARTcharge only when idle, advantageously affording the benefit of well blended oil/refrigerant solutions at pre-warmed saturated conditions..